Remember the ST-Ericsson 3GHz NovaThor A9 from MWC? Want to know a bit more about it and several other chips that work with it to get you fast 4G calls and data? The headline is of course the FD-SOI process that allows the NovaThor SoC to hit 3.0GHz without melting a hole in the steel table it is sitting on. One often overlooked side of this is how much power you can save using the same device at a lower frequency, in this case the same 1.85GHz that the non-SOI 28nm chip runs at. Take a look at the demo below, the two phones at the bottom have their backs removed and an IR camera pointing at them. 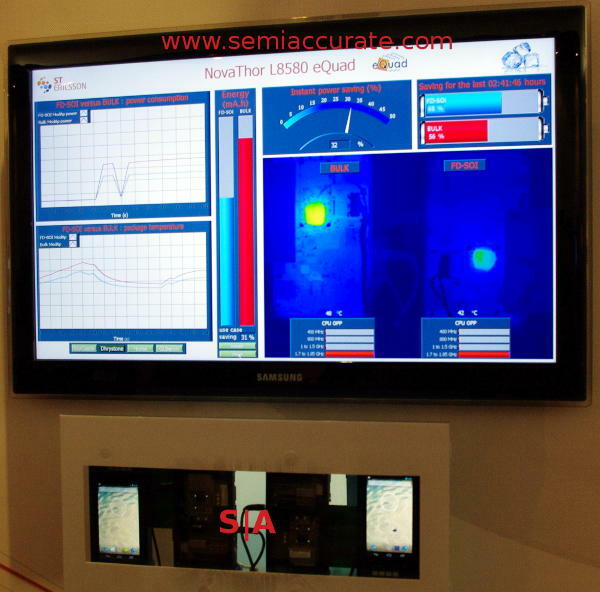 Those images and some related data is shown on the screen above them. Guess which one is 28SOI and which is not? As you can see, over the course of 2 hours 41 minutes, the SOI version of the chip used about 31% less energy to do the same job as the bulk version at the same clocks. This means it runs cooler, needs less of a heatsink to operate, and leads to longer battery life. It is a win/win in all regards for the manufacturer and end user. What’s not to like? For those of you that have been waiting a seeming eternity for Voice Over LTE aka VOLTE calling, it has arrived. 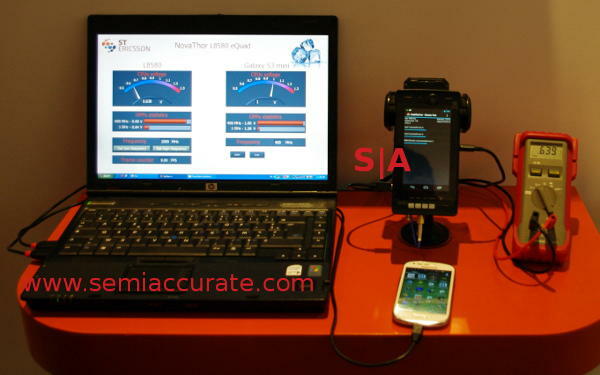 ST-Ericsson was demoing their wideband 7400 multimode LTE modem at MWC, and had a live cell network in their booth to demo it on. The VOLTE call worked just like any normal call, but since it transfers voice as data over a higher bandwidth connection, it can save a lot of battery versus making the same call over 3G. Better yet, VOLTE can transmit a wider frequency band of audio for so called “HD” calling. Basically it sounds a lot better than normal circuit switched voice as well as being less energy intensive. Since the tech has been ready for years now, expect real world deployments before 2019. Maybe. 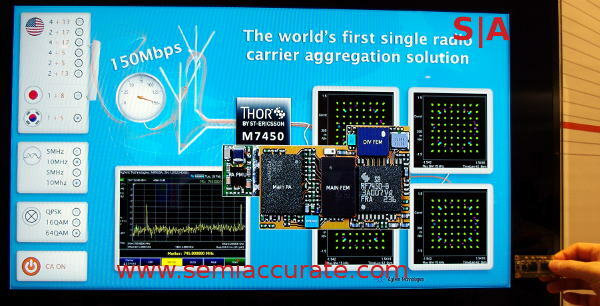 The last demo was again pretty simple to describe, it uses the ST-Ericsson M7450 to do carrier aggregation at 150Mbps on a single chip. For those of you not versed in telecom spectrum allocation minutia, and shame on you if you aren’t in this day and age, what this means is every carrier has a subset of the frequencies allocated to them. In the case of cellular data, each carrier has a different allocation and this can vary a lot by country and even with each one. Hardware makers and base station operators need to be able to support the entire available range, and that can cause headaches. Take for example GSM with it’s 800/900/1800/1900 frequencies, and don’t forget each one of those are subdivided in to many sub-bands which are what the carriers are allocated. The above demo was simple enough, pick a bunch of frequencies and the chip would support all of them to a maximum throughput of 150Mbps. There were US, Korean, and Japanese frequencies in the demo, several encoding possibilities on top of those, and likely more not shown too.